THREE SIZES AVAILABLE: Medium - 130 × 150cm / 51.2" × 59.1", Large - 150 × 210cm / 59.1" × 82.7", XL-180 × 235cm / 70.8"×92.5". 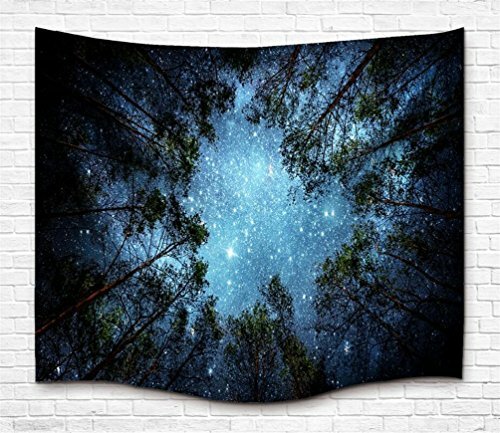 MATERIAL: Made from silky polyester fiber, this star forest tapestry is durable enough for both indoor and outdoor use. FEATURES: Vivid colors, crisp lines and bold graphics printed with state of the art digital printing technology provide an mysterious look. MULTIPURPOSE: These wonderful prints are a great way to add color to your bed, ceiling, and wall. This gorgeous piece of art can be used as bedspread, bed cover, table cloth, curtain and of course as a tapestry or a wall hanging, also perfect to take along to a picnic or to the beach. WASH CARE: Dry cleaning or washing with cold water,do not use chlorine bleach. We offer a full refund if you are not satisfied! ! Do not hesitate to buy! Quickly add to your shopping cart and get your new tapestry!